"These are appetizers, very easy and very good!" I thought these were very salty, and would not make them again. I am not a big fan of Ruebens, so I gave it an extra star to be fair. I loved these. 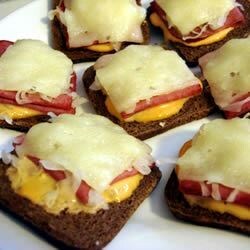 The only thing is, I use my favorite reuben dressing, which is 1/2 thousand island and 1/2 russian dressing. Tangy and zippy. It's perfect! The bread needs to be lightly buttered and put in the broiler for a minute before assembly. Then assemble on the non butter side. That is all this is missing from the real thing.